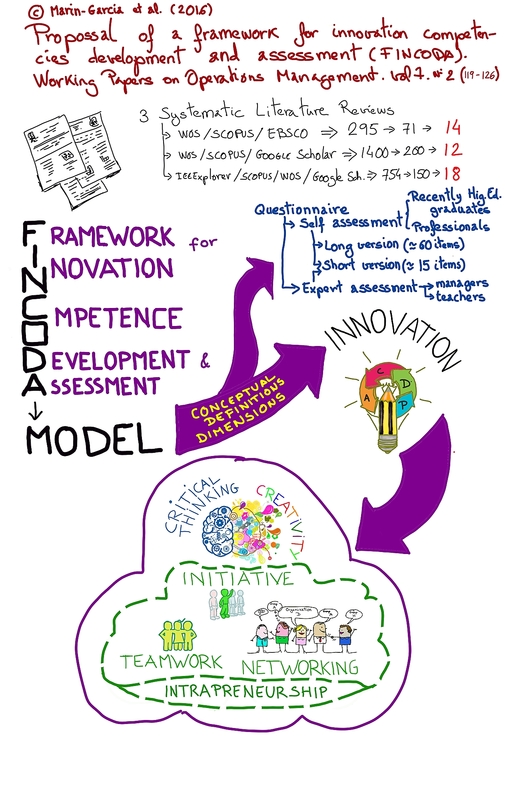 In this article we propose an innovation competence model of the people which is based on the existing literature to integrate and complement existing models. The main contribution of this work consists in demonstrating the differences and similarities of current models and in providing a conceptual definition for each model element. In this way, both researchers and people in charge of human resources in companies obtain a framework with which to design measuring instruments to assess innovation competence, which can fulfill the twofold demand of validity and reliability. This work has been conducted as part of a European project financed by the European Union [“FINCODA” Project 554493-EPP-1-2014-1-FI-EPPKA2-KA] (http://bit.ly/FINCODA-EUsite01). (The European Commission support for the production of this publication does not constitute an endorsement of the contents which reflects the views only of the authors, and the Commission cannot be held responsible for any use which may be made of the information contained therein); and by the Universitat Politénica de Valencia PIME/2015/A/009/A “Evaluation of innovative behavior indicators in university students”. Una vez finalizado el proyecto pasamos a la fase de explotación en nuestras asignaturas de lo materiales producidos y difusión en la comunidad universitaria. En la parte final del proyecto hemos producido varias publicaciones relacionadas con la evaluación de competencias de innovación (individuales, interpersonales y de trabajo en red) en estudiantes universitarios.